Sandra Dalziel and eHealth Innovation Executive Director Dr. Joseph Cafazzo join Patrick Ware, 2018 recipient of the “Kevin J. Leonard Award” in the Leonard Library on May 17, 2018. The “Kevin J. Leonard Award” is presented annually by the University of Toronto’s Institute of Health Policy, Management and Evaluation (IHPME), in collaboration with UHN’s eHealth Innovation to pay tribute to Kevin’s tireless advocacy on behalf of patients. Kevin was an Associate Professor at IHPME from 1996 until his death in July 2013, and also one of the original Research Scientists of eHealth Innovation (formerly the Centre for Global eHealth Innovation). In acknowledgement of this role, Kevin’s former office was transformed into the Leonard Library. Living with Crohn’s disease for over 40 years, Kevin was also a passionate patient advocate who believed the healthcare system could be transformed if patients had electronic access to their own health information, allowing them to be more effective in managing their care in partnership with their providers. Promoting this recognition of ‘patients as partners in their healthcare’ was front and centre in all of Kevin’s advocacy work. In his own life, Kevin was able to access some of his health information and was an empowered partner in his care team. 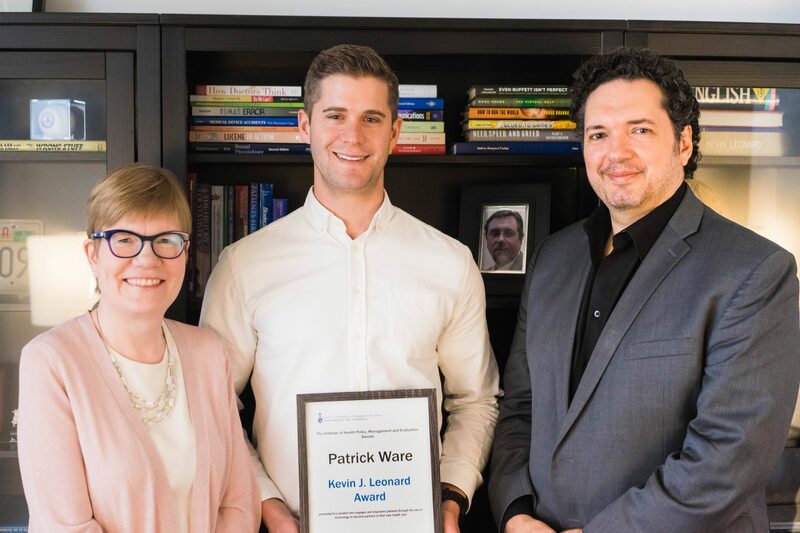 Sandra Dalziel, Kevin’s widow, presented the fifth “Kevin J. Leonard Award” to PhD candidate, Patrick Ware, during IHPME’s annual Research Day on Wednesday, May 2, 2018. The Award recognizes students whose work engages and empowers patients through the use of technology to become partners in their own health. With a keen interest in health informatics, Patrick sought out IHPME and eHealth Innovation to expand his knowledge and expertise. Bringing experience in the design, implementation and evaluation of consumer health innovations, Patrick’s PhD is focused on gathering evidence to determine how to scale Medly, a smartphone-based heart failure telemonitoring program at University Health Network’s Heart Function Clinic. Medly empowers self-management in patients and strengthens the relationships between a patient and their care team. To achieve an essential framework for scalability, not only for Medly but also similar interventions, Patrick is working to fully understand the telemonitoring experience from both the patient and provider perspectives. As a patient with multiple providers, Kevin would have strongly encouraged Patrick’s efforts to enhance the patient/provider relationship to optimize patient health outcomes. Also, in addition to Patrick’s professional accomplishments, a bonus on a personal level for Sandra is the fact that Patrick is a native Montrealer like Kevin and herself.